All weirdos who were drawn here by the the use of 'intimately' can scram. We're just talking quilting. Knowing your machine is so very important to doing good quilting. It just isn't possible to quilt well without putting in the time to learn its foibles and strengths. Otherwise you'll spend so much time adjusting and tweaking and probably ripping out stitches that you might give up on quilting before you have a chance to get good at it. Learn your machine's body- By this I mean what feet work best, when. How is it set up? Are you used to it being flush or set into a table? What setting works the best for whatever project and use? What accessories help you quilt the best? Feed dogs up or down? The best way to know this is to use that machine! Make some practice pieces, make the dog a quilt. Give yourself permission to fail in the pursuit of bettering your skills. Learn your machines likes and dislikes-How does it react to different threads or fabrics? How picky is it about the needle size or type when you use different fabrics. My machine for example, hates sewing in a straight backwards line, so I orient my work so there's always some side to side movement. Some folks have trouble quilting multiple layers of white-on-white or glitter frosted fabrics. (This may just be a need for a different needle.) At what speed does it have the best tension? Do some fabric/thread combinations change it sound? (We'll talk more about sound below) In my Christmas lights video, I talk about the different sound made when stitching on painted fabrics. Learn what makes your machine hum- Or really, what makes your machine go ca-thunk, ca-thunk! Learn the sounds of something amiss. Recently, I was sewing along when something sounded wrong. Not a ca-chunk, but a little rattly sound. I've gotten to know my machine pretty well, so I knew something was amiss with the bobbin. I actually had a good idea exactly what it was and when I opened the bobbin case, I found I was right! How well do you know your machine? Take it for a good test drive! How about the manual? If you have a Bernina, they've got the best educational materials out there for their machines. If you have a Janome, you might have to do a lot of figuring out on your own. Though they are getting better, I am told, with their higher end machines. And now that we've talked so intimately, I've got a confession. The quilt on my bed came from Walmart. But I have non-quilt worthy traffic on my bed a lot! I also have the world's largest cat. Or so the camera angle would lead you to believe. He also uses his claws to get up on the bed. My little guy is quilt-worthy, but his use of my bed is not. He's asleep due to the onset of stomach flu as we later found out. Maybe I'll get some quilting done this weekend. I certainly hope you will! 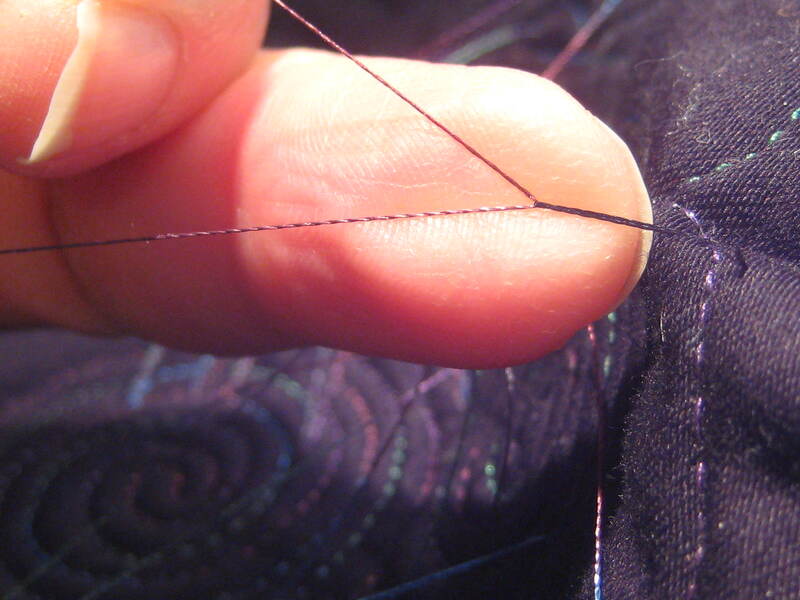 Here's a video of how I bury thread ends at the beginning or end of a line of stitching. I know one thing I do differently from other videos I've seen on knotting is where I tie my knot. I like to do it about 1/2 inch away from my top instead of right at the surface. It works for me. And below is what this area looked like before I started burying ends. When doing an intricate bit of stitching with a lot of starts and stops, I like to minimize how many times I have to cut thread and start over. I will lift the needle out at the end of a line of stitching, and using my knee lift, raise the presser foot and move to an area out of the way of more stitching. 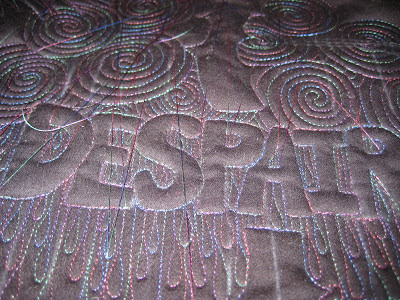 Then I take a single stitch and then move to the next area of stitching, leaving a 'V' of thread. This allows me to move to a new area and still keep the start and stop tails of thread out of the way. Then I cut the bobbin thread and proceed to tie the ends as shown in the video. By keeping those threads intact and located in an area I'm not currently stitching in, I keep from accidentally sewing over the bobbin thread tails while I 'save' the knotting and burying for later. 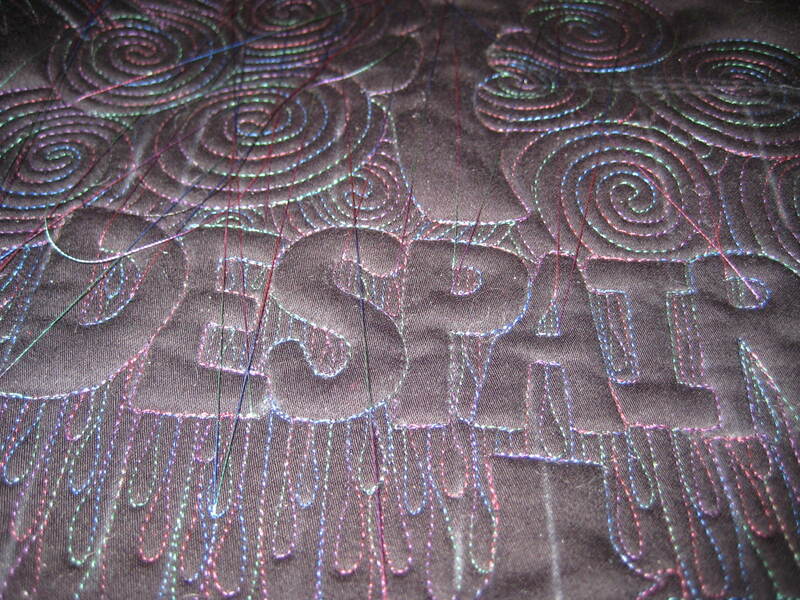 Now, I am off to quilt some more on this project. I swear the next project I do will be more cheerful! I finally got the video uploaded and edited from my Quilted Christmas Lights project, which I blogged about last week. Hope you like it! As I mentioned in the post, it also features the voices of my children in the background along with me using my Super-Mommy voice.